Three men who were part of a gun-wielding gang that attacked a South Yorkshire home have been jailed. Windows were smashed as the gang targeted a house in Toll Bar, near Doncaster, in an 'unprovoked' attack in November last year. Monty Tunney, 29, formerly from York; George Tunney, 21, and John William Stewart, 21, both formerly from Doncaster Road, Armthorpe; and Paul Pannett, 19, of Brigg, Lincoln, then fled the scene. Stewart was carrying a gun. They were arrested and charged with affray, to which all four pleaded guilty. 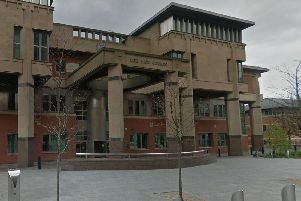 The Tunneys and Stewart were each given a 21-month prison sentence at Sheffield Crown Court on Friday. Pannett was bailed with conditions and will be sentenced in February. Detective constable Andy Hotchkiss said: “This was a targeted and unprovoked attack and I want to thank the victims for coming forward to report this crime to police. “Luckily nobody was injured during this attack, but that doesn’t lessen the impact of this awful, violent crime. “The offenders were quickly arrested by Doncaster officers and I am pleased that all four men have accepted responsibility for their crime.